I managed to squeek in a couple layouts over Christmas. My sister and finace' came up for a visit and the crop room turned into guest room with the help of a couple plastic tubs and some space under the bed. That meant I needed to get my croppin' on if it was going to get done before the show in Northfield. I decided to go with two layouts of the same picture because this show is aimed at non-scrapbookers. I thought it would make a nice compare / contrast kind of thing and picked 2 different styles that were a 180 from each other. One, artsy with almost no intervention and the other allot of journaling. Both blue, both 12x12. For those of you just tuning in, we're showing Scrapped at an art gallery in Northfield, MN on Friday January 5th to kick off it's official opening with a Scrapped screening and an exhibit of scrapbook layouts for a month. It's all art, no commercial interest, no products for sale. 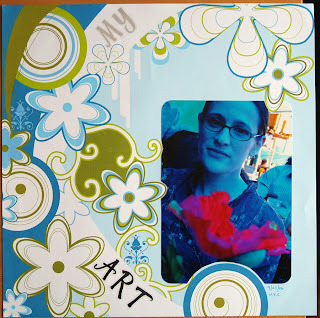 Just a gallery showing what scrapbooking can do to be an expressive medium. Nick and Steve the gallery owners are looking to attract allot of local attention because they're in a great location for walk ins and kind of ground zero for the cool bomb in Northfield. 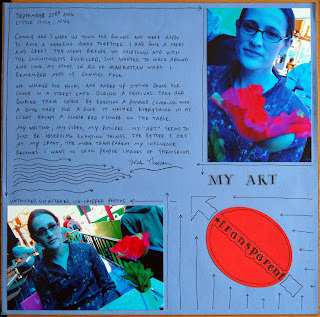 If you'd like to submit a layout ( times almost up ) you can do a layout of any size on the theme "my art" and mail it to Scrapped, 16308 Highwood dr, Minnetonka, MN 55345. Layouts won't be returned, but saved because I hope to be able to do some more shows of scrapbook layouts as art around the twin cities. When I saw the photo of blue Connie with the red flower in front, the angled one, I thought, "Wow, he's really good at photoshop." Then I clicked on the blue page and read the journaling and saw that you didn't crop or alter the photos. that's a really fantastic photo. good eye. ok, they are both angled. i mean the one on the artsy page. Yep, they were digital pictures so I just uploaded them from my computer and checked a box to have a 4x6 and 5x7 printed at the store. I actually had 2 of each made but I mangled the other 5x7 trying to make the photo border match the design on the paper. It was easier just to cut out some shapes that border where the picture was going. I love both of these layouts. Well Nancy bless your heart. I love you for loving both these layouts!